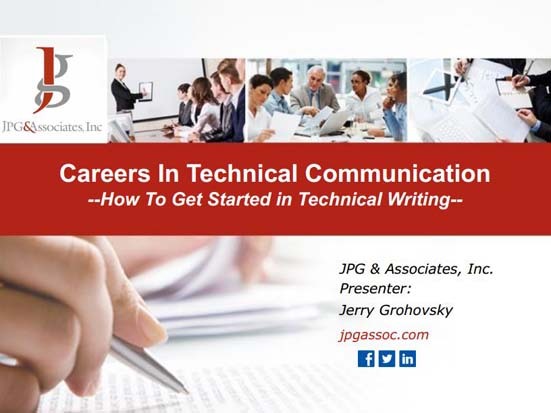 Since 1993, JPG has provided a complete line of staffing and consulting solutions for delivery of technical writing & other technical communication projects. JPG provides resources for technical writing/editing, technical illustrating, graphic design, instructional design, e-learning development, help-file development, web content development, UX, UI, and more. By offering both consulting & staffing services, JPG has the flexibility and bandwidth to support projects in many ways—no matter how complex or large. Industry experience includes: high-technology, hardware and software, commercial equipment, packaging and automation, medical device and healthcare, engineering, heavy equipment, and manufacturing. Celebrating 25 years of providing technical communication services! More than 25 years of focused experience. Technical communication is all we do. Responsible, flexible, and creative in our approach. Always on time, within budget, and with quality in mind. For additional PowerPoint presentations and articles, please visit our Consultant Resources page. We want to thank our customers for their business and support!